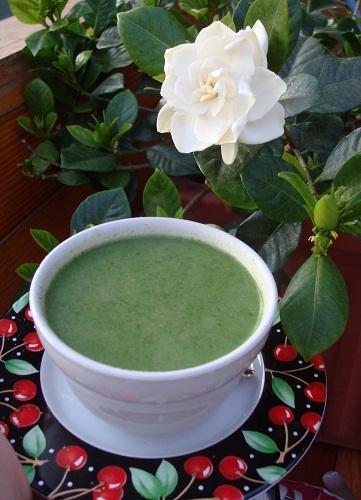 Mmm Spinach Soup… my favorite. So I’m going to share. Nice, huh? 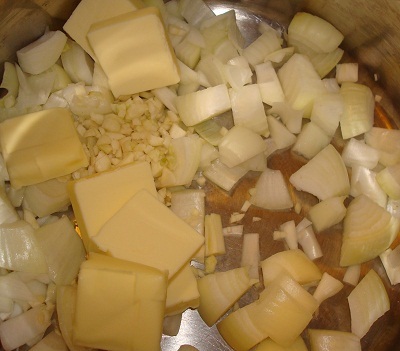 Chop & dice your onions & garlic- and throw in the stick of butter, cut into tablespoon size pieces. Cook until translucent, add a little salt & pepper. Get out your Titan peeler, and if you don’t have one… buy one. It’s one of those kitchen tools you’ll love so much you wont be able to imagine your life before it. Seriously. 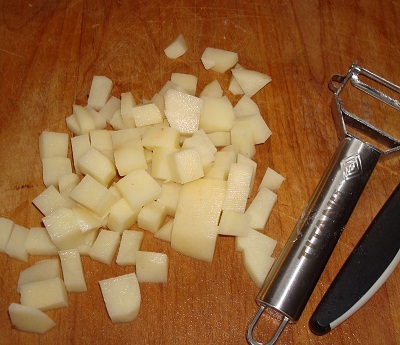 Peel your potatoes, and chop them into fairly small pieces. You’re going to blend them in, so you want them small enough that they cook quickly & evenly. 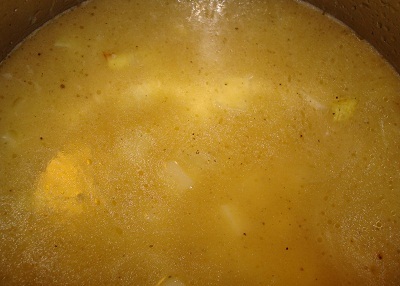 Add the chicken broth, put the lid on your stock pot, and let it simmer for 10 minutes, or until the potatoes are tender. 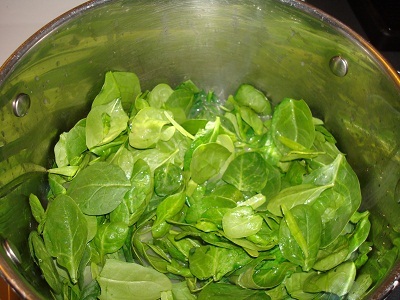 Pack the entire container of spinach into the pot- turn the burner off, and put the lid back on. 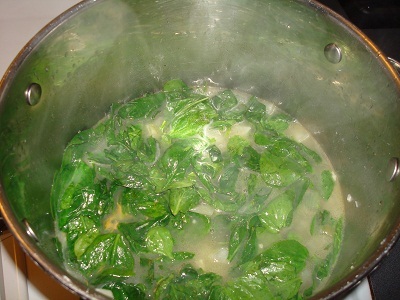 Let it sit for another 10 minutes, or until you can see the spinach has softened. I have a serious lack of patience when it comes to this soup- and it always comes out perfectly. Soft spinach- ready to blend! Now the fun part 🙂 Get out your immersion blender and start blending. If you haven’t bought an immersion blender yet, I wholeheartedly recommend them. I paid $1.99 for mine at the Goodwill so it doesn’t have to be expensive. They’re $20 retail, and the amount of stress & clean-up time they eliminate will more than justify the purchase. 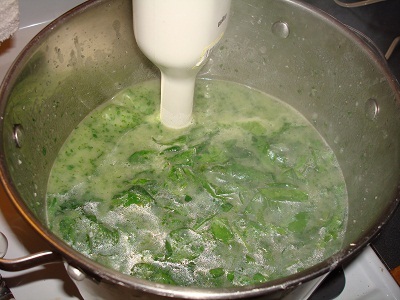 I used to make this soup with my food processor and I can’t tell you how much easier it is with the immersion blender. 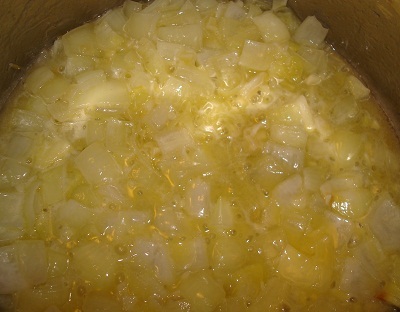 I’ve used it for everything: potato leek soup, whipping cream, Hollandaise sauce, even mixing orange juice concentrate. After it’s blended to a smooth & brilliant green (I’d show you a picture but the camera got all steamy) add your 4 cups of HOT water. Blend a little more, grate a little fresh nutmeg on top…and…. Next Next post: Hmmm, no thank you.